Back in the 50's the original owners built a home that appears to be a Frank Lloyd Wright inspired design. The home had a waterwheel on the creek with ponds and cascading small water falls and pools just below the house. Back then it was called "The Hideaway". In 2004 we remodeled "The Hideaway" and now call it Brown Mountain Lodge, the waterwheel was reconstructed and grounds were landscaped. We added a frog pond and target range, horse shoe pits and outdoor fire pit for family enjoyment. We opened our home for vacation rental in 2004 for families to come up and enjoy this unique property and this majestic area to re-connect with nature and relax from the hustle bustle of daily living. Creekside Cozy Cabin was my parents old home place and after they retired we decided to open it as well for vacation rental. Its appeal and charm are the sounds of the creek at night and outdoor lounge for chilling and grilling with a fire pit to sit around and take it all in. The family sized kitchen and big screen HDTV in the living room make for a relaxing evening after a fun day on the River. Both homes have trails right behind the house for immediate access to Pisgah National Forest. ​Come up and on summer nights listen to the Whipporwills and the sounds of nature, the amazing night sky looks like glitter flung across the horizon. Reconnect with your loved ones in the Gorge and create your family traditions and life time memories at our secret in the Hills! 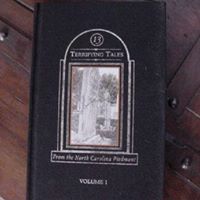 Jeff Shook penned the story # 10 in "Thirteen Terrifying Tales of the NC Piedmont" which is story about the "Brown Mountain Lights". A copy of the book is on the mantle at each home for interesting reading by the campfire as well as other great mountain times publications about the area. Wilson Creek Cabins pet friendly cabin rentals are located between Grandfather Mountain, Boone and Blowing Rock......in the Wild and Scenic River Gorge below Grandfather Mountain. Come visit and enjoy the great outdoors and come home to a interesting cozy mountain cabin, have a fire in the outdoor lounge and grill dinner and enjoy the sounds of nature. After that settle in for a good movie in the living room before retiring in comfortable beds for a restful nights sleep. "Thirteen Terrifying Tales of the North Carolina Piedmont"